An interesting, and some would say unethical, demonstration of the privacy vulnerabilities of Facebook has landed one reporter in an Australian jail, while his iPad was confiscated by the local law authorities. Ben Grubb, Deputy Technology Editor, smh.com.au (The Sydney Morning Herald), theage.com.au (The Age), brisbanetimes.com.au (Brisbane Times), and watoday.com.au (WA Today), reported on a demonstration by noted security expert Christian Heinrich. In that demonstration, Heinrich targeted the wife of another security expert, one he evidently does not get along well with, to show the dangers of Facebook’s security vulnerability. The flaws in Facebook’s security, Heinrich says, can affect any Facebook user if targeted by a hacker. In his demonstration, he accessed the private photos of Chris Gatford, director of HackLabs, and his family. Regardless whether Heinrich’s demo was ethical or not, it was shortly after he met with Grubb that things took a turn into the Twilight Zone. Soon after his article on the demo went to print, Grubb received a call from Detective Superintendent Errol Coultis. I was reassured when he said he had no intention of arresting me and I agreed to help with his inquiries. Neither of them wore police uniforms — their casual clothes, including Coultis’s AusCERT-branded T-shirt, comforted me further. The officers were polite and there was even an amusing interlude when the female officer’s iPhone rang, disrupting her recording of our conversations, and I gave Coultis some advice about how to set the iPhone to avoid further interruptions. They seemed to treat me like a technical expert, and sought my explanation of what Heinrich had done. I felt like they were trying to get me to admit that his actions were illegal. I told them it was not my job to decide that — after all, I was only reporting on the matter. It’s their job to decide whether what he demonstrated was against the law. When I questioned under what legislation they had the right to seize my iPad, Coultis told me I was under arrest in relation to receiving unlawfully obtained property. What indeed. It is easy to see how the authorities might be able to go after Heinrich, who accessed the private info in his demonstration, but to arrest the reporter who covered the story? That has far too many Orwellian overtones for me. Being a good child of the information age, Grubb not only called his boss but also tweeted his arrest to his 5,000 followers on that platform. In short order, both Grubb’s account and that of the Queensland Police media unit were bombarded with messages of support for Grubb and outraged inquiries as to why the journalist had been arrested. I was told that forensics officers were going to make a complete copy of the information on my iPad, whether it related to this matter or not. Think about that for a moment. This young man is a journalist. He is also a classic digital native, highly engaged on both personal and professional levels with a multitude of social platforms. Police forensics will be making a copy of all of his personal data as well as his business data. For a journalist, that could include private and proprietary information on sources used for his articles. How would you feel? All this young man did was report on a conference. That is the job of the Fourth Estate and one that should not be impeded in this fashion. The unfair targeting of journalists in defiance of the protections they normally enjoy is disturbing. It seems far more the type of news one would expect from a more totalitarian regime. The fact that is occurring in Australia is something that should trouble all of us. A journalist is supposed to observe and report. That is their function, pure and simple. Granted, there are many of them that barely deserve the title, but that does not mean that they should be detained and have their property (physical and intellectual) confiscated by authorities. Additionally, if a journalist’s private data is so easily and nonchalantly confiscated and copied, what chance would anyone else have in similar circumstances? This does fit into the grand debate about data and its confidentiality that has been growing across the globe. Facebook has yet to respond to media inquiries as of the time of this writing. 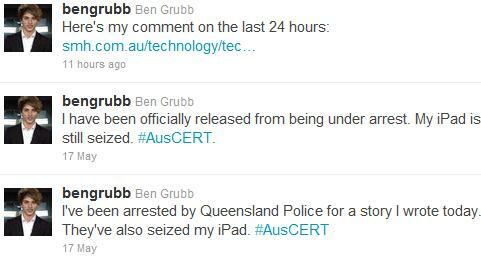 Screencap of Ben Grubb’s Twitter page is used under Fair Use: Reporting.